This has been a very busy week, and (as so often seems to be the case) it’s only Wednesday. * Everyone is memorializing Alain Robbe-Grillet. * The Joshua Tree, she is fallen. Don’t tell Bono. * The number 10^122 keeps popping up in theoretical physics, directing one to the only possible conclusion: it is God. 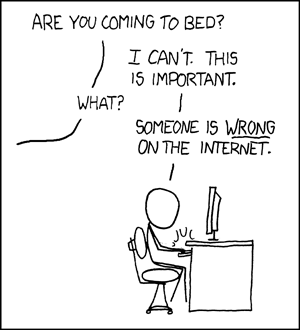 * And xkcd gets it right again.